Entrepreneurs have been trying for years to turn low-value wastes into high-value products. 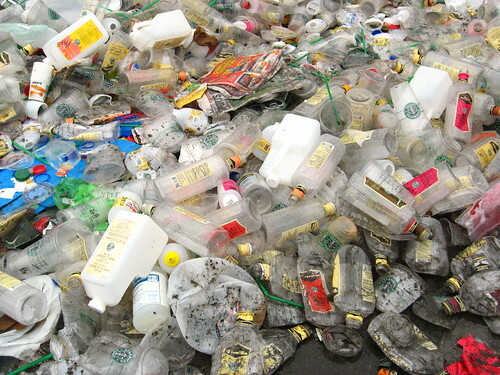 Waste plastic is among the lowest in value, and gasoline or diesel fuel the highest, but machines to do that conversion usually consume a lot of energy and get gummed-up by leftover material that they cannot convert. Now a company in Washington, D.C., is trying out a new way -- heating the plastic to a very carefully controlled temperature range, with infra-red energy. The company, Envion, is expected to cut the ribbon on Wednesday morning on a $5 million plant that it says will annually convert 6,000 tons of plastic into nearly a million barrels of something resembling oil. The product can be blended with other components and sold as gasoline or diesel. "We are the world's largest oil consumer and the world's biggest producer of waste," said Michael Han, chairman and chief executive of the company. This process will convert one to the other for about $10 a barrel, he said. An important element to the conversion is that the process is electrically powered -- no fuel is burned on-site to run the converter -- so that a renewably-powered plastic-to-gasoline facility is inevitable. This is quite a game-changing development given that we're drowning our land and choking our seas with plastic -- much of it not recyclable. This process offers at least the hope that we'll find a way to stay afloat. On the other hand, it's worth observing that plastic represents a fairly stable way to sequester carbon. By turning it into fuel and then burning it, we're putting even more carbon into the atmosphere. But if this scales massively and ultimately is able to displace conventional oil production (itself a carbon-intensive process) we might be looking at a real win-win. See! I stayed positive all the way to the end.